A new type of hurricane shutter, the “Hurricanescreens” product provides a 21st century solution to all the elements of effective hurricane protection. 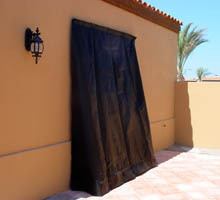 The polypropylene fabric is similar to KEVLAR used in protective vests; providing superior hurricane windows protection. The densely woven screen reduces 200 mph winds to 10 mph. Our unique angled installation provides a space air cushion between the screen and the slider window glass. There is no direct wind pressure against the glass as occurs in flat screen installations. The angled screen also prevents flying debris from contacting the glass. The screen is anchored with stainless steel anchor/bolt units that exceed 4,000 pounds "pull out" per anchoring station. These are spaced 24 inches apart at the top and bottom of the screen. The material and installation meets USA missile impact requirements. The material sheds 80% of water impact and blown sand/dust and is 80% translucent. Average sized (5 window) deployment time is one hour. The system is maintenance free. A 5 window system can be stored in a 2x2x3 foot container. It is the ideal solution for the resident or non-occupant homeowner interested in protecting his furnishings and window structures. Our "Hurricanescreens" are locally manufactured. This saves each of our customers an average of $900 in import and shipping costs. Local manufacture also reduces order-to-delivery time, which can exceed 6 to 8 weeks during hurricane season. Local manufacture also assures immediate correction of measurement or fastener errors without reshipment and re-import costs.